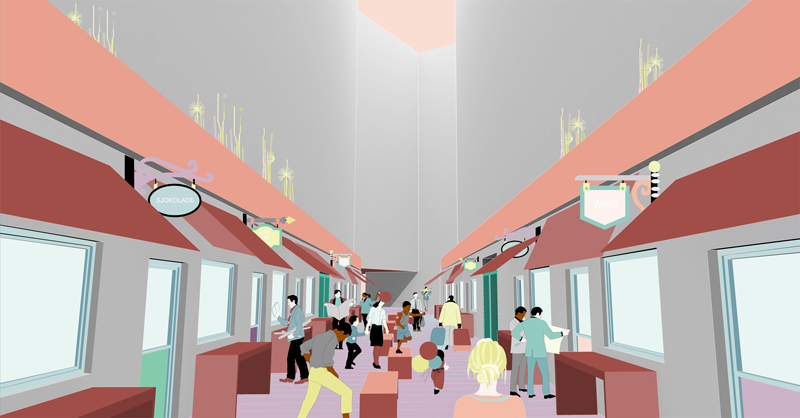 B y creating an urban design project where the “in-between” spaces are the primary architectural interest, a sequence of spatial and visual connections are preserved and created. The scale and density of this project respond to the conditions of the existing neighbourhood. 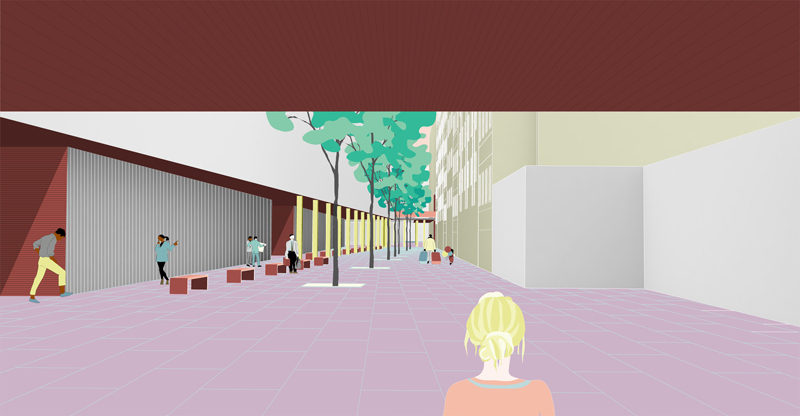 A variety of open and public spaces is introduced to the site, where the streets and squares differ in size and use. Each of them creates a specific quality that responds to the existing site and enhances the given spatial features. 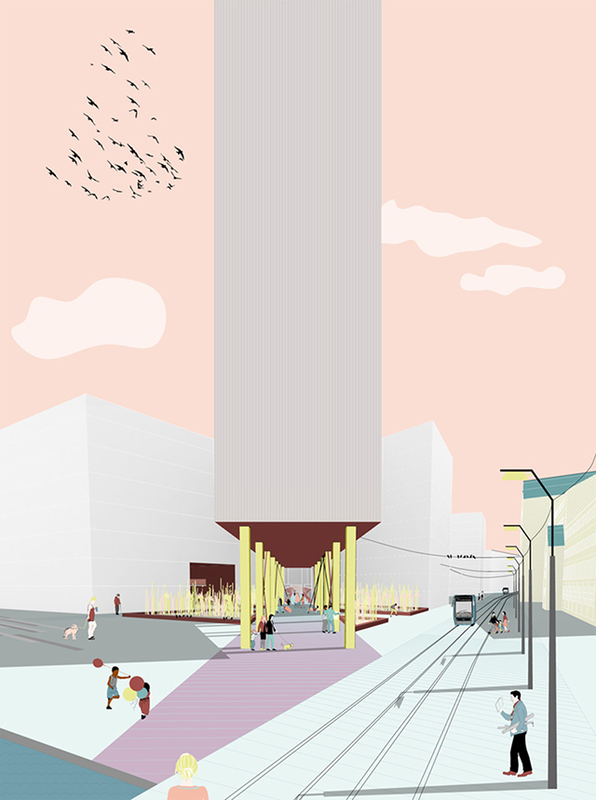 Vital public urban areas within this “most visited place in Norway” become the formative and restrictive factors of future developments. They function and contribute to the existing neighbourhood regardless of the program. After crossing the park you start walking towards Gronland. You enter beneath the Floating Tower. High wild bushes hide the view towards the passages that lead into the buildings. The space consists of different elements that enhance the feeling of nature in an urban environment. 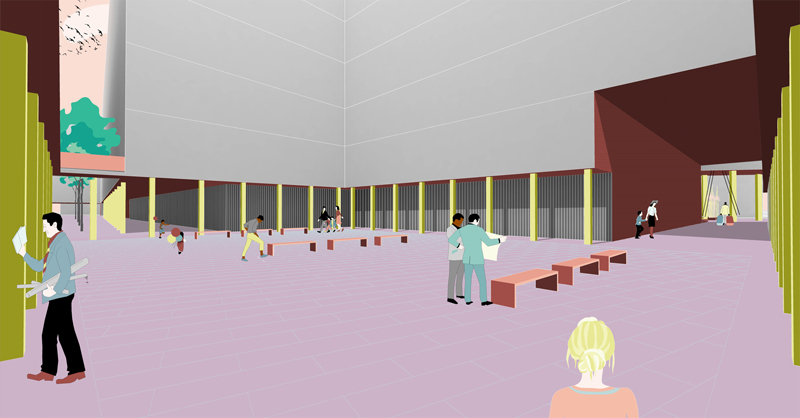 The building floats above you and a small park and accentuates the entrance to the Narrow Street, positioned diagonally towards Gronland. You can linger here, sit on a swing and observe the views towards the waterfront and the towers by simultaneously being protected from the elements by the Floating Tower. By walking underneath the tower you enter a lively Narrow Street filled with small shops. 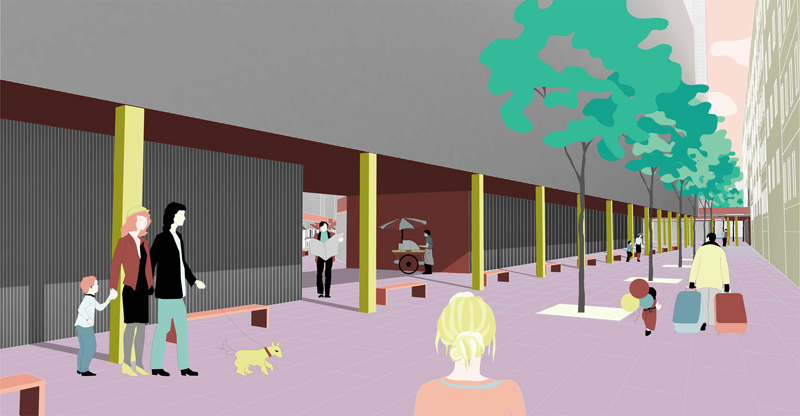 The small width of the street enhances the feeling of crowdedness in an urban environment. The street is like a canyon cut through the high buildings. The diagonal positioning of the street allows for sunshine to enter the Narrow Street which gives it light and warmth. At the end of the street you are presented with a choice. You can turn right, towards the Sunken Playground, which leads towards the pedestrian bridge over the tracks, or you can turn left into the Dramatic Street and exit towards Gronland. 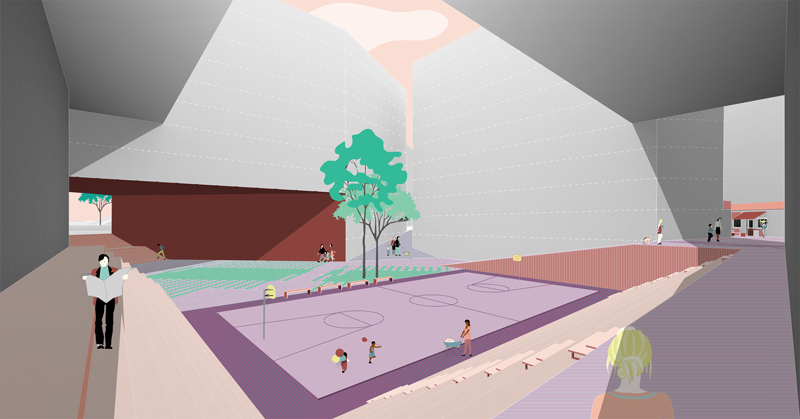 The Sunken Playground allows for the uninterrupted and safe play in an area that, being below the level of the adjacent street is enclosed from all sides. The height and cantilevers of the adjacent buildings provide shading in the summer months and protection from rain during the winter months, allowing for a comfortable outside play area throughout the year. You can sit on the steps, observe or play a basketball game or just enjoy the fresh air under the protection of the cantilevered building. The Dramatic Street is created as a short connection from the park to Gronland. The architecture enforces the narrowing perspective towards the central station which makes the walk through it more dramatic and uncertain. The entrance is framed by a passage which enhances this central perspective view. The tilted axis which disables you to see the end is a spatial condition that appears often in Oslo. There is no clear destination at the end. You only see a glimpse of the top floors of a distant skyscraper. Through a row of columns and trees you enter an opening. A Colonade Square is positioned at the end of the street. The entrance is framed by buildings and a short bridge connecting them. The open space is unexpected. Since the streets leading to the square flank its angles, you can’t perceive the scale until you enter it. You notice connections through the existing buildings to the lively street market on the north. You also see the river when you look towards the south. People rush beneath the colonnades towards the tram stations and river. You realize that you have made a full circle and are back in the park. You sit on a bench and look at the water.